Lightly season lamb shanks with salt and pepper and set aside for 20 minutes. Heat canola oil in a heavy-based pot and sear the lamb shanks over high heat until lightly browned. Remove and set aside. Remove all but 2 tbsp of the oil remaining in the pot and sauté the garlic, onion and fennel until softened. Add the bay leaves, black cardamoms and tomatoes. Stir well, add the water and bring to a boil. Add the lamb shanks, red wine and apple cider vinegar. Braise until meat is almost tender. Add the carrot and cook for another 15 minutes. Add the button mush-rooms and season to taste. Remove the lamb shanks. Add the thickening to the sauce and bring to boil. 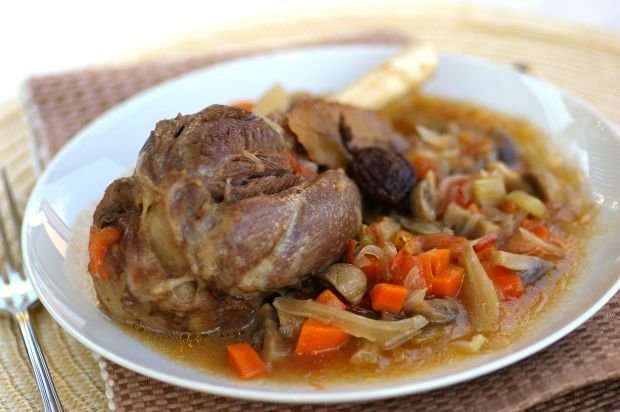 When the sauce is thick, return the lamb shanks to the pot and keep warm until serving time.